What a strange, wonderful, befuddling book, the first novel of one of Vietnam’s most important contemporary writers, Duong Thu Huong—of course I’d never heard of her, given the provincial habits of Americans regarding writers in translation. (This one is also thanks to the clerk at McNally Jackson. Always trust a man who starts ranting and muttering when you ask him a question about a book, is the lesson here!) 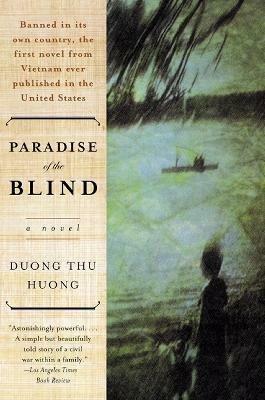 I read Paradise of the Blind through, then turned around and started it again, partially for the beauty, and partially because the culture and concerns were so alien, I’d just started figuring it out when the book ended. The protagonist, Hang, describes herself as “a pale young woman with a lost, worried expression, stooped shoulders, and cheap maroon wool suit. A frightened human being of about eighty-two pounds.” She’s an “exported worker” in Moscow, and the novel takes place mostly in flashbacks, as she takes a train across Russia to visit a communist-party uncle sometime in the 19080s. Her story, as she starts it, “had all happened long before I was born,” by which she means that her family’s fate was determined long before her birth, when the rise of Ho Chi Minh and the Vietnamese communist government in the 50s forced land reform on the villages, split families, persecuted prosperous peasants, and created divisions in Vietnamese society still reverberating 30 years later. Hang’s family tree is a diagram of those divisions. One aunt is a rich peasant, who was stripped of her property during land reform, but came back much richer, and vehemently set on revenge. Her mother is a small-businesswoman (selling snacks on the street), despised by both the aunt and the communists. The mother’s life was destroyed by her brother’s (Hang’s uncle’s) ties to the communist party, yet the mother continues to love, support and serve him—because he’s older, and a man, as her culture demands. “‘Unhappiness forges a woman, makes her selfless, compassionate,'” the mother tells Hang. As an American reader 30 years later, coming from one of the most individualistic and rootless cultures on earth, I found it hard to empathize with Hang. Her sensitivity, her weeping, her self-loathing and self-sacrifice were alien, and off-putting. “Get off that train! Don’t go!,” I wanted to shout at her. But at the same time, my very negative reaction demanded a closer look. My heart denied her obligations because imagining living with them was too painful. So when I stopped, read, listened, and accurately absorbed the forces arrayed against her, she became not weak and annoying, but tough and brave. Duong, the author, was a political dissident in Vietnam, and some of the bravery on display is her own. The Paradise of the Blind is Vietnam, in her telling. Even this title displays the subtlety and reverberating dissonance that makes her prose, and the entire story, so excellent. I find that my brain jumps to “paradise.” The word sets up an expectation that we’re reading about someplace good. And then “blind” is layered. There’s a blind old man in the book who is not an evil character, but simply blind, and in fact a continuous and thus comforting presence in Hang’s slum neighborhood. But if we can overcome the positivity bias set up by the word “paradise,” a place that is paradise only for those who cannot accurately see it, is in fact no paradise at all. And it’s precisely this that the young Vietnamese must struggle against—a society where all that has been set up to be good, true, idyllic and valued must be exposed and questioned, most especially the Vietnamese traditional heartland, the countryside, the most idealized and thus most difficult to examine. Hang describes the countryside where her mother is from as “stifling” at times and of “terrifying, unnerving beauty, like a revelation,” at others. Hang is from both those places, the brutal and backwards countryside, and the one tended with love. Understanding her is a gift. The book is a revelation. And I could basically read that prose forever.